Want to charm a sweetheart or a mom? 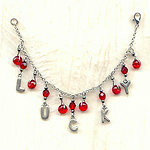 This bracelet is just the ticket! Transparent red glass heart charms dangle from a high quality 14kt gold fill bracelet to make this the epitome of a gift of love. The larger hearts are 10x9.5mm, while the smaller are 6x6mm. The bracelet measures 7-1/2" long, and closes with a dainty toggle clasp. Wearing your heart on your sleeve never looked so lovely before! 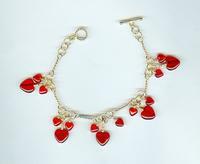 It's another fabulous charm bracelet from SPARKLE PLENTY.